I’ll start by talking about baseball. I watched most of the Phillies’ season finale on Sunday and I felt a bit of… if not, sadness. As crazy as that might sound. Of course, it might be crazy to experience disappointment about about a last place team finishing its season. Especially since I didn’t watch most of their games, and I’m not their most diehard fan. However, upon watching the 11-0 demolition of the Mets, I felt that I should have watched more games. Not that my presence in front of the TV would have willed the Fightins to more victories. But there is a sense of anticipation every time I watch the Phils play. Maybe each game will present some thrills – such as Nick Williams’ inside-in-the park home run in the season finale or Rhys Hoskins power surge. Now, about the Union. Unless the miracle of all miracles takes place, our boys in blue won’t find themselves in the playoffs (well, as of this second, I don’t think we’ve been mathematically eliminated. But I could be wrong). I’ve known for sometime that the MLS playoffs will not feature a touch of DOOP. But like any Union fan, I approach each match with an enormous sense of anticipation. Maybe Andre Blake will display why he has attracted the attention of suitors from across the pond. Jack Elliott might show why he has been a regular in the starting eleven. C.J. Sapong might keep inching toward the club’s single season scoring record. And the Union might actually topple one of the league’s better sides – like they did against Seattle a few days ago. The end of the season is also sad because – as crazy as it sounds – I’ll miss the feeling of possibly being aggravated after 90 minutes. Let’s see… just some of the moments of aggravation emanating from the Union this season: conceding late against Atlanta at home, Bedoya’s missed penalty against Toronto, and David Villa’s in-his-own half of the field goal (which would have been a joy to watch – if it had been against another team). But those moments of feeling aggravating after dropped points is quite good – feeling upset/disappointed about our numerous goals conceded in the last 15 minutes lets me know that I’m emotionally invested in the Union. And actually more excited about the next match – because I’m often hopeful that three points is on its way. The end of the season is sad because… well, I feel a sense of envy and jealousy. Not healthy emotions to feel but when I see packed houses in places like Toronto and Seattle in late October and November. But I say to myself… why can’t such scenes be duplicated in Chester? Union fans deserve more opportunities to will our men to titles. I remember seeing the scene at then-PPL Park on TV prior to the kickoff in the 2011 match against Houston. The place was rocking and I was hoping such an atmosphere but would become customary in October. Unfortunately, it hasn’t yet. The end of the season is sad because… we have to wait until next year. 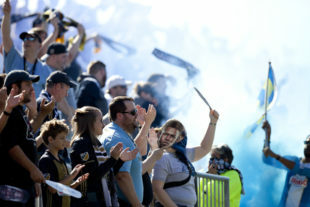 Author: Rashaad Jorden I've followed MLS since its inception, but I was dying for the day Philadelphia (having grown up in suburban Burlington County) got its own MLS team. Since then, I've been a Union fan -- even if I've only attended two matches. I’m still savoring the emotion I had during the 2014 Cup final. A few inches to the right and Nog’s a legend. Imagine the scenes. What could have been? How can I still feel so emotional about it now? I saw a stat before a PL match last weekend; one side hadn’t beaten the other since the 1950s. I saw another stat about the Eagles not beating the Chargers (in CA) since the 1970s. There’s still time for us to succeed and grow, even in these times of quiet desperation. There’s always next year, the sporting constant beckons. The only thing I’ll miss is the beer deck and the few times the team got their act together towards the end of the season (against Dallas, Toronto and Seattle). Curtin got them to play at their best against top teams but could not get them to play well away from home and against weaker teams. Can not wait to see him go. This morning, after missing the (latest?) STH renewal deadline for a monthly payment plan, I alerted our Talen Energy Stadium neighbors as much, so that they might get first dibs on expanding their foothold. I took the opportunity to thank them for being such good match day company these past six seasons (and to scold the most injured family member about overexerting himself during their house renovations). … all of which increases this founding member’s ROI on his Patreon donations to this excellent site. Thank you, PSP! Lousy year, year after year. Next year is my last as a season ticket holder if team doesn’t make playoffs…. You seem to have 1 year longer patience than me (who has been a founding member). I have had it and will not renew unless I see good things happen during the off-season. I’m with you, Guido. After 8 years, they need to show me how committed they are to adding difference makers to the club. I am with you, Charlie. For me though it starts with this offseason and a real commitment to bettering this roster and spending the money that is required to join the majority of the rest of the league. Results are what they are and they won’t win every game, but I want to see a real effort, backed up with real players, and then of course (hopefully), real success, or my Founding Member (in what will end up being) nine year run as a STH will be over.